Over half of the 250 passengers are accounted for and presumed dead. 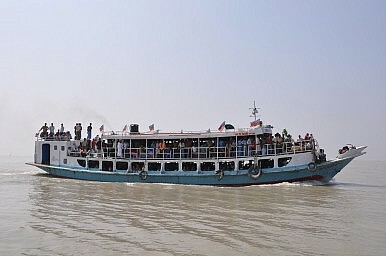 An overcrowded passenger ferry, the Pinak 6, sunk on Monday in the Padma River near the Bangladeshi capital of Dhaka. The police chief of Madaripur, the town where the ferry took off from, has stated that there were around 170 to 200 passengers on board the ferry. However, surviving passengers estimated that there were at least 350 passengers on board, and local officials estimated that there may have been 450 people on the ferry when it sank. Bangladesh ferries do not keep records of how many passengers board their ships, which prevents any official record of how many passengers were on Pinak 6. This lack of accountability also contributes to unsafe overcrowding on passenger vessels, which is common in Bangladesh. The boat that sink on Monday was licensed to carry about 85 people. Thanks to the help of divers from the Bangladesh Fire Service & Civil Defense and the Bangladesh Navy, as well as some locals, about 100 passengers have been rescued. Around 14 people have been confirmed as dead, with the rest of the passengers unaccounted for. According to a local newspaper, Tofazzal Hossain, an official the Lauhajang Police Station, told journalists that the ferry capsized in the middle of the Padma River around 11:00 am local time when it was travelling from Kawrakandi terminal to Mawa. The ferry is believed to have sunk because of dangerous winds and currents, along with extreme overcrowding. Another surviving passenger told Agence France-Presse that although there was no storm, the weather was cloudy, the river was rough, and the waves were huge. He explained that when the ferry was abruptly hit by a big wave, he managed to escape from a window, but the ferry sank fairly quickly. As one of the poorest nations in Asia, Bangladesh ferries have a notorious reputation for sinking. According to AFP, “Officials have said more than 95 percent of Bangladesh’s hundreds of thousands of small and medium-sized boats do not meet minimum safety regulations.” The poor safety measures, lack of sufficient boat maintenance, outdated vessels, and overcrowding combine to create frequent, dangerous ferry accidents. Back in May, for example, a Bangladesh ferry with during a storm. Of the 200 passengers on board, 54 people were killed. Another ferry incident occurred in March 2012, when a boat carrying around 200 passengers collided with a cargo boat and sunk, resulting in the death of around 50 people. Kelwin Choi is an editorial assistant at The Diplomat.